Manchester City and Liverpool had to settle for a point apiece as they battled out a thrilling draw at Etihad Stadium. A hugely entertaining game was littered with talking points, astonishing misses and a sense of injustice for both sides as they felt they were on the receiving end of debatable decisions from referee Michael Oliver. James Milner put Liverpool ahead against his former club with a penalty six minutes after the break, after Gael Clichy was penalised for a raised boot on Roberto Firmino. Sergio Aguero scored against Liverpool for the fifth successive Premier League game at Etihad Stadium from Kevin de Bruyne's perfect cross after 69 minutes - before both sides wasted glorious opportunities to secure a vital win in the race for top-four places. Aguero was particularly culpable, stumbling at the vital moment after his superb approach play had fashioned a clear chance eight yards out. After he fluffed his shot, De Bruyne hit the loose ball against the post. Adam Lallana produced a candidate for miss of the season when he somehow failed to tap Firmino's pass into an empty net before, in stoppage time, Aguero volleyed over the sort of chance he normally takes with comfort. The scoreline only scratches at the surface of a game that was enthralling from start to finish, illustrating the strengths and weaknesses of both sides, who possess verve in attack but frailty in defence. City and Liverpool both created and missed the sort of chances that could have turned one point into three and made life a little easier in the closing stages of the season. City's Raheem Sterling could not find the final touch to David Silva's cross in the first half, with Fernandinho missing a presentable finish standing behind him. The second half was when the real gifts were passed up. Liverpool manager Jurgen Klopp threatened to rip his cap off in a mixture of shock and disgust when Lallana, the ball presented on a plate by Firmino for what should have been a formality, somehow contrived to fail with his connection and the ball rolled apologetically away. Sterling then lobbed Liverpool keeper Simon Mignolet but the ball drifted wide - with City's real opportunity coming deep into stoppage time when Aguero sent a volley off target at the far post from another superb De Bruyne delivery. Both sides had to settle for a draw - but both know it could have been so much more. The life of a referee was summed up by the sight and sound of Michael Oliver incurring the wrath of both sets of players at various points throughout a chaotic 90 minutes. 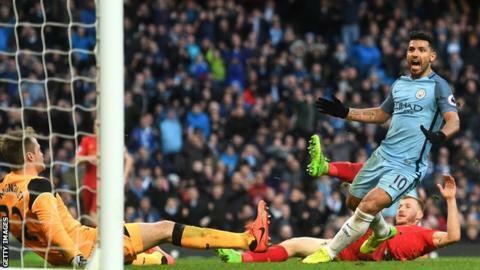 Liverpool felt they were denied a penalty when Sadio Mane tumbled under a challenge from Nicolas Otamendi in the first half, although the striker also inadvertently made contact with his own leg as he shaped to shoot after escaping the City defender with embarrassing ease. Yaya Toure was perhaps fortunate to only receive a yellow card after a wild lunge on Emre Can caught the Liverpool midfielder in the chest, while City were furious their penalty claims were ignored as Sterling went down under a challenge from Milner as he closed in on a finish in the six-yard area. City's players were furious after Liverpool's penalty award - many continuing the discussion with Oliver long after Milner had completed the formalities - but Oliver got this big call right. Clichy's foot was dangerously high on Firmino as he raced in on goal and Oliver had no hesitation in pointing to the spot. It was a tough afternoon for the official as the big decisions came thick and fast. City boss Pep Guardiola and counterpart Klopp were both delighted with the performance from their teams - but the body language in the technical area also revealed huge frustration. Victory for either man would have been a crucial psychological blow as they fight for a place in the top four but both saw their teams waste the sort of chances that could have secured what they craved. Guardiola and Klopp were both animated in frustration in the first 45 minutes, especially at one point when they were united in mutual dissatisfaction in the technical area, the Catalan racing towards his opposite number for an exchange that concluded with a flamboyant high five. Klopp was leaping around in frustration, threatening to throw his cap to the floor as Liverpool squandered good positions, while Guardiola almost slumped to the turf in anguish after Aguero's later miss. City remain a point ahead of Liverpool in third with a game in hand as Klopp's side lay fourth - while the result suited Manchester United best of all as they are now four points behind the Merseysiders with two games in hand after their win at Middlesbrough. "Congratulations to Liverpool and Manchester City. It is one of the days I am proud the most. "I have not had a long career as manager and it is one of the most special days of my life. "The Champions League defeat was so tough for us and we recovered today with our mentality and attack, but we could not attack more because Liverpool are a top team. "I want to stay here and help this club make a step forward and the battle to qualify for the Champions League will go until the last day. "We played three days after going out of the Champions League. How the players suffer and fight to qualify against Barcelona, Borussia Monchengladbach, how we play in the second half against Monaco, to be out was so tough for all of us. "The players in training did not speak. How they reacted against Liverpool means a lot." "Our players did really well. I struggled on the final whistle to be really happy but it's a success to get a point at City and to play like this. "It's more than OK what we did but we needed a bit more luck. "The Sadio Mane situation - it was a red card and a penalty. In a game like this, it would've killed them. "But maybe they could've and should've had a penalty too. 1-1 is better than nothing. "They are too good to always defend perfectly. When we started playing football in the game, it was really difficult for them. "Between 50 and 65 minutes we could have decided the game and we didn't. "We can't speak today about faults and mistakes. Before the game, if someone told me I would get a point at City, I would have taken it." City have gone seven consecutive games without defeat in the Premier League (W4 D3 L0), their longest streak in the competition under Guardiola. Liverpool have won more points in 10 games against the top six this season (20) than they have in 10 games against the bottom six (19). Milner has scored seven penalties in the league this season - only Steven Gerrard (10 in 2013-14) has scored more for Liverpool in a Premier League campaign. Milner now holds the record for the most Premier League games scored in without losing (47 games: W37 D10 L0). Only Gylfi Sigurdsson (11) has made more assists than De Bruyne (10) in the Premier League this season. The Belgian has assisted Aguero more times than any other player this term (3). City have failed to keep a clean sheet in each of their past 13 games in all competitions against Liverpool, shipping 24 in the process (W2 D5 L6). Manchester City have another crucial period coming up after the international break which could decide their top-four status. First they travel to the Emirates to face Arsenal on Sunday, 2 April (16:00 BST) and three days later they face Chelsea at Stamford Bridge on Wednesday, 5 April (20:00 BST). Liverpool's next Premier League fixture is not an easy one either - they host Everton in the Merseyside Derby on Saturday, 1 April (12:30 BST). Match ends, Manchester City 1, Liverpool 1. Second Half ends, Manchester City 1, Liverpool 1. Attempt missed. Sergio Agüero (Manchester City) right footed shot from the centre of the box is too high. Assisted by Kevin De Bruyne with a cross. Attempt missed. Sergio Agüero (Manchester City) right footed shot from the right side of the six yard box is close, but misses to the right. Assisted by David Silva. Corner, Manchester City. Conceded by Divock Origi. Substitution, Manchester City. Fernando replaces Leroy Sané. Attempt missed. Roberto Firmino (Liverpool) right footed shot from the right side of the box is close, but misses to the right. Assisted by Sadio Mané following a fast break. Attempt saved. Raheem Sterling (Manchester City) right footed shot from the centre of the box is saved in the bottom right corner. Assisted by David Silva with a through ball. Kevin De Bruyne (Manchester City) hits the right post with a left footed shot from the centre of the box. Assisted by Sergio Agüero. Substitution, Liverpool. Divock Origi replaces Philippe Coutinho. Attempt missed. Roberto Firmino (Liverpool) right footed shot from the left side of the box is close, but misses to the left. Assisted by Adam Lallana. Offside, Liverpool. Nathaniel Clyne tries a through ball, but Sadio Mané is caught offside. Goal! Manchester City 1, Liverpool 1. Sergio Agüero (Manchester City) right footed shot from the centre of the box to the bottom left corner. Assisted by Kevin De Bruyne with a cross. Attempt missed. Nicolás Otamendi (Manchester City) header from the centre of the box misses to the right. Assisted by David Silva with a cross following a corner. Corner, Liverpool. Conceded by Willy Caballero. Attempt saved. Roberto Firmino (Liverpool) right footed shot from the left side of the box is saved in the centre of the goal. Assisted by Philippe Coutinho with a through ball. Attempt missed. John Stones (Manchester City) header from the centre of the box is close, but misses to the right. Assisted by Kevin De Bruyne with a cross following a corner.